A little bit louder now...: Ever seen the movie Pure Luck? 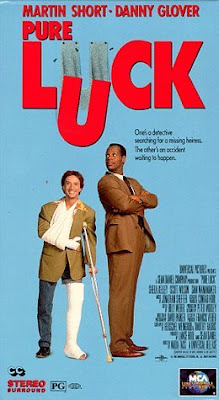 Ever seen the movie Pure Luck? Sorry guys, my blog has been pretty lame lately. I've been insanely busy. I've been hit by a car, drive by egged, had the hood of my car flip up on the freeway and pretty much every other outrageous thing that you can think of. I got a new phone and I just barely learned how to use it. The offices of Dukepoo and Associates can now return your calls and text again. The other day I left work at lunch because I thought I was going to die or pass out or have a seizure. So instead of doing something dramatic, like projectile vomiting on my computer, I decided to go home early. All I wanted was to be home in bed. But the universe had other plans for me. Malibu Sue decided to over-heat on the freeway. She has been in critical condition after a nasty car wreck last month and her internal organs couldn't take it any longer. After a tow truck ride, waiting around at mechanic shop, and trying to stretch $3 at the Asian supermarket I received the news. Malibu Sue is dead. Her ashes will be scattered across the Pacific in a ceremony celebrating her life and bravery. Farewell sweet princess! So sometime soon I am going to be sporting around a new ride, well an old ride. A blast from the past. No, not the Ferrari. 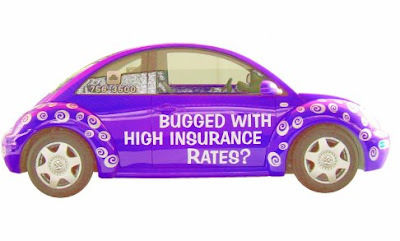 I'm gonna be driving the Insurance Bug. So come one come all, step up to the line. I am no longer a homeless gypsy. Hotel California is almost set up for visitors. If you're lucky, I'll even take you on a ride down the coast in the Bug. It's nice to see you've FINALLY updated your blog...We used to love that movie. Maybe you could get a job as a "cooler" at a casino-just walk around spreading bad luck! I would be very good at that job too. Ruby threatened to move out there with you again today, in fact she ran out the door with her backpack. Your car hood flipped up?!?! That is one of my worst nightmares...well, that and my car exploding at the gas pump. Oh, and a drive by egging? Who does that? Update your blog. Or die. please. When you stop blogging, I stop being entertained. That means, I've been bored since Aug 2. I need you to blog. Kaythanx.